Earlier this year I was shooting the wedding of Eduardo and Rory in The Morrison Hotel in Dublin. This venue is in a perfect location if you are looking for a city vibe. There are so many places around the hotel to go with your photographer and take in some of the fun Dublin atmosphere. I had the pleasure of talking to Aurelie Stach from The Morrison who was kind enough to answer my questions which will give you some insights into the planning process and hopefully will help you pick your wedding venue. What should a couple consider when choosing their wedding venue? A wedding is one of the most memorable days in a couple’s life. The countdown to their wedding day is an exciting time but can also be stressful as they plan the perfect day. When couples choose their wedding venue the most important aspects to consider are the date, the capacity, the location, the style and most importantly the budget. What mistakes do couples make when choosing their venue? Couples rarely make mistakes with their wedding venue as they know immediately from the first visit if it is the right fit for them. It is like choosing a wedding dress, when tried on you just know, your gut feeling lets you know if it is the right decision or not! One of the most difficult aspects for the couple is to visualise the capacity of the room. The tables and dancefloor will take up the most space. However, sometimes couples forget about how much space other items take up such as larger dancefloors, additional decorations, cake displays, photobooths etc. These all take away from the floor space which can change the number of people who fit into the room. At the Morrison, all our wedding couples are assisted with the room layout and table plans. We have an expert team on hand to assist with the room layout and décor. What kind of couples is your venue for? What makes your venue different? We have been very lucky to work with a wide variety of couples in recent years, everyone is very different! The Morrison is such a versatile property, there is no standard couple to us. We attract wedding couples who are looking for something a little less ordinary but with a very high standard of service. Couples who love Dublin city centre are attracted to us for our location. 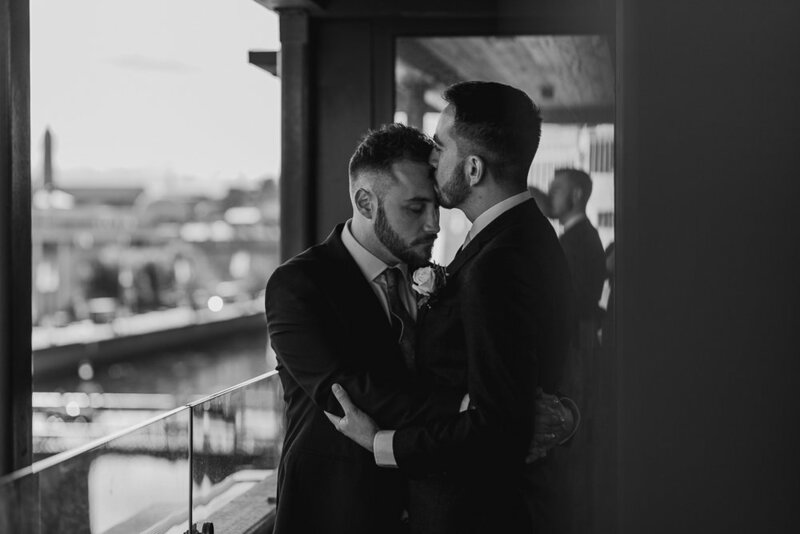 We have also dealt with many LGBT weddings who continue to book with us again and again. The Morrison is ideally located “In the Heart of Everything in Dublin”. We are perfectly placed close to a variety of venues to hold your civil ceremony such as Smock Alley, Trinity college and the iconic City Hall. Not to mention the abundance of picturesque urban settings including the famous Ha’penny Bridge, Phoenix Park and Christ Church Cathedral where you can capture beautiful and unforgettable memories. We are an exclusive and unique wedding venue. Due to our unique style and funky design, we are the perfect venue for couples looking for something that little bit different. We welcome all guests through our private Art Gallery which offers a private entrance from Ormond Quay. This is the perfect spot for champagne and canapés. This space spills into a private Courtyard Garden which in turn leads into the main event room Printworks, with oak floors and white walls. This blank canvas can be dressed, themed or lit to your own personal preference. What’s your best advice for making a wedding venue your own? The best advice we can give for making a wedding venue your own is to pay special attention to the decoration on the day. This is a great opportunity to show a couple’s personality and show something that brings them together as one. One example is travel, or where they first met. Couples have incorporated places they have visited into their table plans and shown photos of favourite memories they shared together. Also, making your own decorations is a great way to get family and friends involved in the special day. We recently had a bride whose father made all the table centrepieces, this was a lovely way for him to contribute to the preparations. How far in advance should a couple book their desired wedding date for peak time/offseason? It is advised to book the wedding date at least one year in advance. However, we often have couples coming to us a few months before the date they are looking for. We are very flexible and will work with the couple to make it all happen. Booking the date and venue gives a starting point to the planning process. Once this is done couples can begin planning everything else. How many people can you host? Have you got the minimum number? Printworks can seat up to 200 people for a wedding, however, our minimum numbers for a wedding package is 100. We can cater for additional evening guests if required. We have a second event space, Halo, a split-level event space which is available for more intimate, bespoke weddings. Halo can seat between 55 and 85 guests. The upper level seats 60 and the lower level seats 25. With high ceilings, floods of natural daylight and a mix of eclectic art these spaces are perfect for couples looking for something that little bit different. 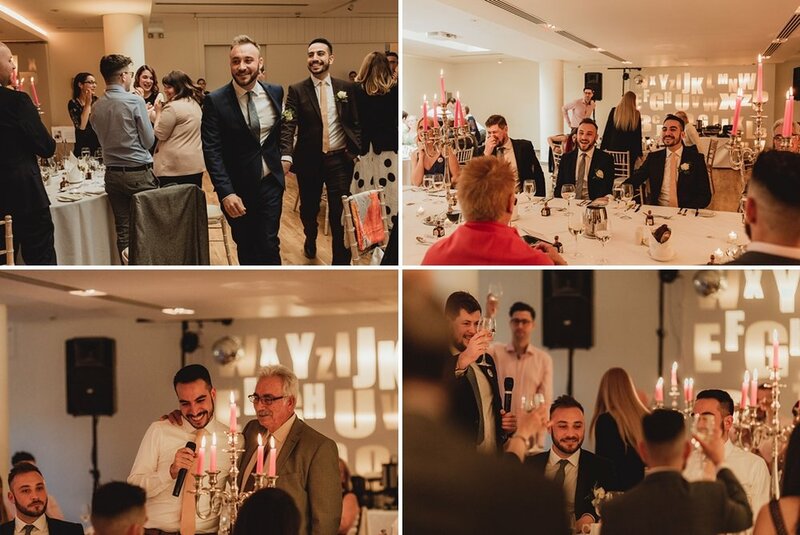 For couples who want to party the night away after dinner with some additional guests, Printworks is the perfect space to move to. Printworks can cater for up to 250 people for an evening party. You & your guests would also have access to our outdoor area the Courtyard Garden on the night. Do you have specific locations that your couples love using with their photographer for family photos, couple portraits, etc? Our Hotel is located in the centre of Dublin city, which enables couples to get beautiful city shots on the Ha’penny Bridge, at Christ Church Cathedral, or even in Temple Bar. However, the hotel also has some beautiful locations to have photos taken. In front of the mirror in the Art Gallery and in the Courtyard are popular spots. The most popular has to be in our beautiful Penthouse Suite Dublin with wraparound views of the city overlooking the River Liffey. What is the most common package you sell and why do couples like it the most? We are delighted to offer a prestigious wedding package for the couple’s special day. Here at the Morrison Hotel, you can choose from our packages: Head Over Heels or Fire & Ice. Our wedding packages start at €75 and include: red carpet on arrival, glass of Prosecco or a bottle of beer per person on arrival reception, bottle of Champagne and strawberries with a selection of canapés for the wedding couple on arrival, four-course meal, evening finger food, complimentary suite on the wedding night for the couple & champagne breakfast for the couple the following morning. Thank you again Aurelie for your time! For any enquiries, please contact directly Weddings & Events Teams at the following email address: weddings@morrisonhotel.ie or by phone +353 1 887 2458.